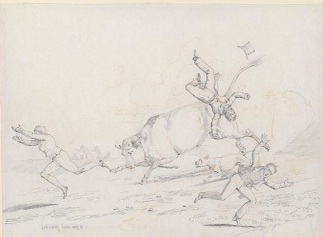 MIDDLEBURG, VA - Scraps: British Sporting Drawings from the Paul Mellon Collection, takes its title from Henry Alken's series of drawings and prints that depict varied and often-humorous episodes of sporting and country life. The drawings on view in these galleries feature artists' attempts to capture these transitory experiences-those that might not seem momentous enough for grand works of sporting art but are, for many, the very essence of sport and country life. Those who commissioned paintings such as the works on display in the Paul Mellon Collection in the adjacent galleries often valued a formal vision of sport that conformed to established traditions and motifs. This exhibition, however, celebrates drawings and the greater freedom they allowed artists with which to indulge a personal vision of the animals, sport, and country pursuits they encountered and observed directly. This exhibition was organized by the Virginia Museum of Fine Arts, Richmond, Virginia. The National Sporting Library and Museum is dedicated to preserving and sharing the literature, art and culture of equestrian and field sports. Founded in 1954, the institution has over 24,000-books dating from the 16th-21st centuries. The John H. Daniels Fellowship program supports the research of visiting scholars. The Museum, a newly renovated and expanded historic building on the Library campus, houses exhibits of American and European fine sporting art. Information is shared through exhibitions, lectures, seminars, publications and special events. The NSLM is open to researchers and the general public. Admission is free. Library Hours: Tuesday-Friday 10 a.m. to 4 p.m. and Saturday 1 p.m. to 4 p.m. Museum Hours: Wednesday-Saturday 10 a.m. to 4 p.m. and Sunday noon to 4 p.m. For more information, visit The National Sporting Library & Museum.